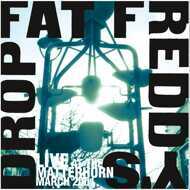 The album that captured the essence of Fat Freddy’s Drop jam origins, ‘Live at Matterhorn’ is being released on heavyweight vinyl for the first time. Originally released on CD, the new limited edition 2LP 180gm vinyl features four tracks ‘Runnin’, ‘Rain’, ‘No Parking’ and ‘Bounce’ that span a total of 70 minutes with the songs taking up a side each. The recording was made in March 2001 when Freddys was honing its sound and chops in the Wellington underground music scene. The stage was literally the back garden of Wellington’s den of inequity The Matterhorn. The audience consisted of a random collection of 30 people most of whom from memory were hospitality workers having a drink after work. Freddys had started as a few musician mates playing along to instrumental B-side records dropped by DJ MU and by 2001 had grown to a solid six piece who liked nothing better than to jam. It’s Fulla Flash aka Warren Maxwell on saxophone, the fore runner to Chopper Reeds, and trombonist Hopepa aka Joe Lindsay is yet to join but Freddys distinctive hi-tek soul qualities shine through led by the velvet vocals of singer Joe Dukie aka Dallas Tamaira. Freddys early jams, the source for where Freddys story began.